In a city where the law is nothing but letters in a book, where not only city hall but even the police itself are under the control of rivaling gangs, in a city where everyone with a bit of importance is wearing a fedora, that’s the city five rival gangs of, well, gangsters are at war over. That city officially has no name other than Mafia City. Realistically, however, we just assumed it was Chicago from the get-go. There’s no way to look at the 1920’s period police car and the characters in card art wearing hats and not think of Al Capone. And so you find yourself once more as a prohibition area gangster boss, trying to wrest control of the city from your rivals. You won’t do much alcohol smuggling and shooting rival gangsters, though, as Mafia City is a game of majorities – and sometimes mayorities – not a game of strategic crime. The majorities in question are, of course, gangsters. Each turn you send one of your gangsters – appropriately represented by poker chips – to one of the games seven locations. At the end of a round, when all mafiosi have been placed, each location is worth victory points and a bonus action. The system for that is straightforward enough: the player with more gangsters wins, in case of a tie the player who’s chip is lower in the pile – who’s gangster arrived earlier – wins. Instead of placing a gangsters, you can also play one of your few and precious hand cards. Hand cards are your most important strategic resource, more important even than gangsters – not only because of what they do, but als because of the threat they represent to the other players who don’t know what cards your holding. Cards allow you to steal cards from other players, move their or your gangsters from one location to another, send them to jail and other fun things like that. In addition to the text effect, all cards also one of four symbols and an associated secondary effect: interrupt other card actions, hats take gangsters back to your hand or even get more gangsters from your reserve, score extra points in a specific location or, and this one is a big one, take another action after you passed already. Usually, once you passed, you’re out for the round. But if you can play a card with a Bullet, you may take another action later, to everybody else’s dismay and inconvenience. The card effects are powerful – and fun, when you see the anger on your opponents’ faces – but new cards are hard to come by, so you better make sure that every card you play makes a difference. Once all players passed, the locations are scored and the winners get to use the locations special action. Initially, the order of scoring locations is set. Harbor: control the Harbor and you also control the Hitman. You may move the Hitman miniature and play a Hitman card to kill an opponent’s gangster, sending him back to the reserve. Keep in mind, though, that you need a card for that. The Hitman’s movement is the only part of the game that is influenced by the variable board setup, by the way, so in this game having a variable board didn’t add much. Fight Club: the first rule of Fight Club is that it doesn’t matter here who got here first. What did you think the first rule was? We’ve done that joke to death already while playing, I wouldn’t use it again. The second rule of fight club is that, in case of a tie, no one gets the points but all players get the action: take an additional gangster from your reserve for the rest of the game. Police Station: of course the police is not the impartial force of law you’d like it to be, this is Chicago-or-something-like-it. When you control the Police Station, you take the Copper minature. It lets you look at the other players’ hand cards at any time, as often as you want. Doesn’t sound like much? Read the paragraph about action cards again, knowing what options the others have is a pretty big deal. Business District: wealth in Mafia City is measured in cards, and that’s exactly what you get here. Three, to be exact, and then you discard one, but doesn’t have to be one of the new cards. Gentlemen’s Club: you may play one card with a Star symbol to score an additional victory point. City Hall: like in the Fight Club – which I don’t want to talk about – who came first doesn’t matter in the City Hall. If there is one player with the majority, he gains the Mayor miniature. And damn, it’s good to be Mayor. 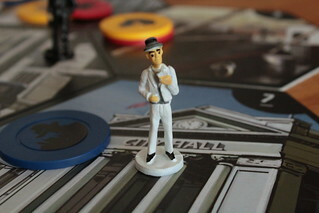 The Mayor decides in which order the locations are scored – if no player controls the Mayor, the regular order applies. That’s obviously quite handy. He also controls the order of locations to remove gangsters from in the next phase. Not quite as obvious, but still handy. But for each location, he also decides in what order the players have to decide to remove their gangsters or not. That’s rarely handy and slows the game down by an unacceptable amount in a basically boring cleanup phase, so I’d strongly recommend you skip that part of the Mayor rules and just let the Mayor go last when removing. 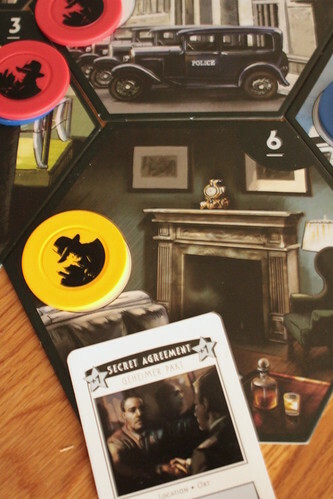 When all locations are scored, as implied by the Mayor role, you decide which gangsters to leave on the board and which to take back to your hand. Taking them gives you more options to act next round, leaving them makes sure they start out low in the pile. Not an easy decision, like so many others in the game. After that# you only draw cards before the next round. It’s one card for everyone, one more for the single player with the lowest score and one more for him if he also has the least cards in hand. Since the cards are rather powerful, this is usually a sufficient catch-up mechanism. If you were looking forward to alcohol smuggling, tommy gun fights, nightly police raids and other kinds of gangsterly excitement, you might be bit disappointed by Mafia City at this point, it’s hardly a simulation of gangster life. But that would be unfair to the game because it’s actually an entertaining and tactical majority game with added options through action cards and space for bluffing and temporary alliances. We tended to enjoy the game more with fewer players because each player has more goons at their disposal, allowing for very satisfying, sweeping manoeuvres: “I’ll score the Harbor first, then after I win it I’ll use the Hitman to eliminate a gangster in Jail. That gives me control there and I can arrest a gangster from the City Hall – god knows there’s no shortage there – and make sure I stay with control of the Mayor”. With five players, this sort of domino effect is rarely feasible, if you get the Jail or the Harbor you can count yourself lucky already. 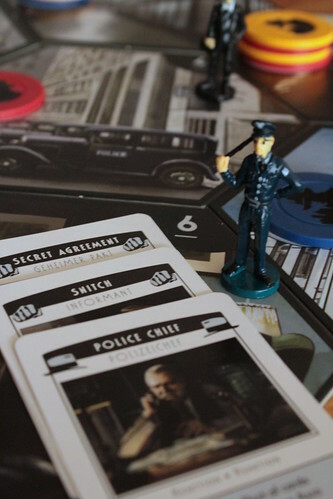 And while strategic play is rarely possible in Mafia City, circumstances just change to quickly, playing in three lets you make a host of tactical decisions every round and luck is less of a factor than you might expect with the powerful action cards in play. Playing in five is much more chaotic and the feeling is that you need more luck to win. However, it’s possible that we didn’t (ab)use the possibility of forming alliances enough in the bigger games, there’s certainly potential there. All in all, we enjoyed Mafia City, a great deal, it really gets a lot of mileage out of its relatively simple mechanics.